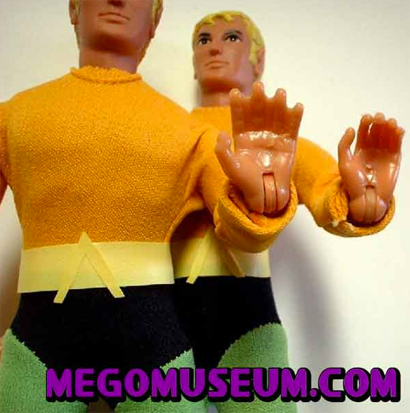 Courtesy the awesome MegoMuseum.com comes this shot of the uber-rare, never-produced web-handed Aquaman doll. Apparently this version was shown in a 1978 catalog but never put into production. This sole example resides in the (presumably non-webbed) hands of a Mego collector. If you haven't ever checked out the Mego Museum, make sure you do--but only if you've got many, many hours to kill! It's like visiting the Met, but a lot more fun. The Mego Museum is still the best toy community online. Thanks to the folks who have ran it in the past and/or are running it now like Scott, Brian, the other Scott and Steve! A swell bunch of folks who love the same things we do.